While I agree that traders have to trade a decent equity I think this change is a defeat for Darwinex. A bit less meritocracy and a bit more "equitocracy"
"peanuts for peanuts" is not a good mantra. Too many dodgy traders forced Darwinex to introduce these rules. These rules are a necessary evil. He dont read posts from Darwinex Community. I agree with all that but why the min equity it's hard to understand. Let's take the case: I trade with100€ and 3days before the end of month I ad 5k if I'm in a good rank in darwinia. Or every time I have a DD I as money to ma tain the equity at required level. Darwinia should not be the objective of the traders, the objective should be to get aum from the investors. We have to be an asset not a liability for Darwinex, the difference is to work to get investors VS only come here to get prizes from darwinia. If you trade well, soon @DarwinexLabs will appear in your darwin, meritocracy again, and there It is easier to make fees with him than with Darwinia. I think the key point is the divergence issue. A trader who got 300 000 Aum with a 3000$ account will have 100 leverage between his account et the AUM. Then when he throw un mini lot (0.1), the system have 10 lots to throw. I agree but I think that you know that I am right. They corrected something wrong with something wrong. It was necessary but from now on the vision is weaker. I dont believe in 900 poor traders but if even 9 traders are really poor this rule is wrong and unfair. It is a step back: investors want to see equity and we give them equity, the hard old reality. Increasing of equity doesn't en crease the quality of traders. The minimun equity is precisely to avoid these type of actions. That's OK but this rule is applied even on the case of DD, the 2 cases are very different. I think this rule will fix the problem but I am not able to be happy about it. It is a compromise between skill and wealth, because pure skill is too difficult to spot. The Darwinian way hasn't been enough without the traditional way. Dodgy traders and traditional investors forced Darwinex to pollute the original vision. 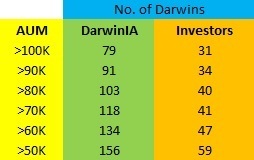 90% of my earnings come from Darwinia, @DarwinexLabs is going in and out and his result is negative. I think that Darwinex reacted quickly increasing amount of prizes and the number. It is very important in the short term that they input the other proposal of letting add the investment in our own Darwin. To create every business it is necessary to invest a minimun equity. Probably their initial vision was too good for real people, too advanced for everyone, including me/us. I have read all 214 posts and been thinking what to say. Again it has been quite charged discussion. Last time we had something like this was when Darwinex moved clients money to different bank. I made quick judgement back then and later accepted that it was not right thing to do. So I cooled and then posted this. I hoped that my post/feedback on that issue would be implemented for the future decisions too. But I think that hasn't happened as we have another heated debate here. So here is my opinion. I agree that change in DarwinIA has been needed. What I find unfortunate is the type of change and how it has been announced. All this heated debate could have been avoided if Darwinex decided to use better communication and give more time for changes to be implemented. Also I understand that the decision is ultimately up to Darwinex but this issue affects directly trader's profits and therefore it could have been discussed first with traders in some way before final decision has been agreed. Maybe there could have been some type of survey or something. Also I don't fully agree with the new change but something had to be done. The way DarwinIA was functioning was very bad business deal for Darwinex and amazing for traders. Instead of making this post very long I will explain my position on this in new thread. This new decision results in ''taking'' money from traders. Darwinex gave traders way too much to start with and now when they are trying to somehow consolidate so their bottom line is not affected too much, traders are protesting. It's understandable. So my message to other traders. Darwinex gave you too much in DarwinIA competition. Do not get angry because now if you don't put more money in your trading account you may lose some allocations. Wait few more weeks and Darwinex will come up with something better. I agree that increasing equity should not increase the quality of the individual trader. But maybe with the average trader, we could find some correlation, or perhaps not be so sure. I have extracted this data from the platform. Attached the average results of the darwins with more than 12 d-period (D-EXP=10) of every frame in the last 2 years period. It seems that there is a difference between equities higher or lower of 2K. This comment is worth more than 5 spanish podcasts!! I egree with your numbers even there can be some hiden factors . Does the closed darwins figure in the overall number? More, we can't separate before and after ESMA changes etc. Despite this, the probleme for me reside elswhere. Many traders come to darwinex attracted by darwinia. There are many exemples of traders distributing their signal(s), in other social platforms. This change make darwinia much less profitable for them. So even we can imagine that a number of traders are going to bring more money , it's a reality that many others will quit darwinex. Or these traders , good or bad, are a source of comissions for darwinex. The question which we will never get an answer is: how much darwinex can afford to lose traders. For me darwinia should have never existed. Many darwins under 1000 are forward tests. It happens with me and my CVL . It happens also with others that manage more darwins like @Pulse07 and @integracore2 . If it works for me and other communicative traders it can work for the population. Now I lowered it to 1200 trying to fine tune . The closed darwins are not there, because I have filtered since 1 euro to avoid 0 equity.